One of my favorite things to do is collaborate with people that I love on fun projects! Josh Hailey is a photographer and artist and musician and silly man and one of my best friends from Jackson, MS. He has been traveling the country for the past 2 years to take pictures and videos and find out what people think about the state of life in America. Check out the Photamerica website to see some of his adventures! Throughout our search for artists and songs, we have found that state names pop up in tons of songs! It seems that singing about our homes and about our travels are recurring themes for musicians today and throughout the history of our country. State Your Song hopes to tell stories of America through a wide variety of sounds and styles. Please pass the website on to anyone you know with a state song or the desire to write one! Let’s go places!!! 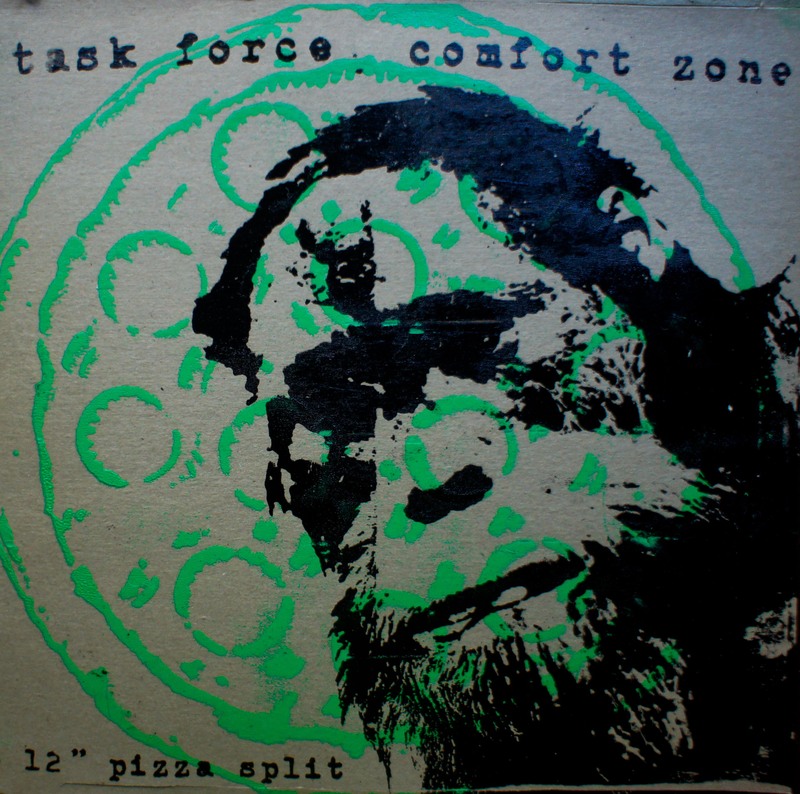 Last week, along with our friends Distro Sux, we released the Comfort Zone/Task Force 12″ Pizza Split. We have been working on this record for months and I’m super proud of how it turned out. 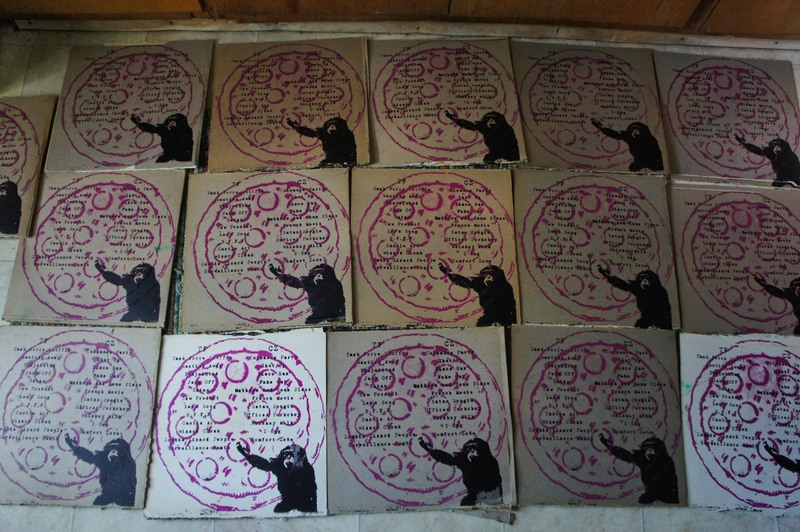 It has been a community effort of pitching in to screen print, stamp, make posters and lyrics pages and press 300 records. 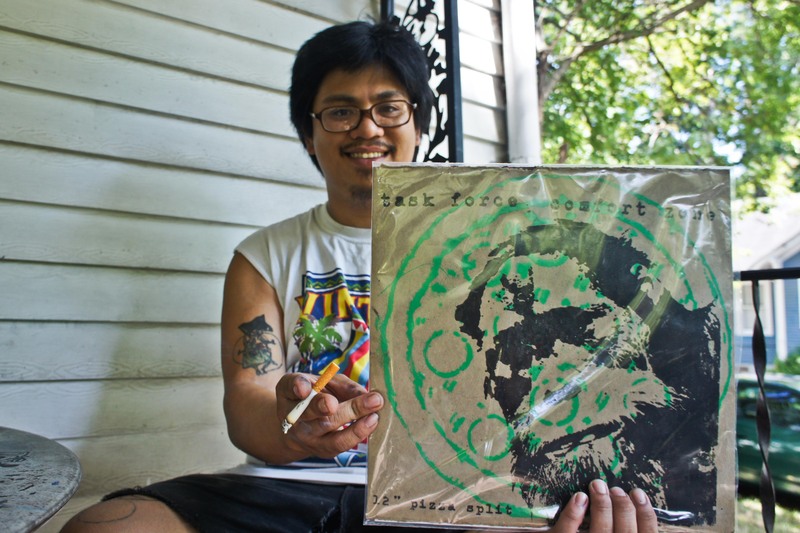 The record itself has 23 total songs and I think it really reflects the punk community here in Columbia. If you hold one in your hands, read the lyrics and listen to the album you will know what I mean. Also, go to Hairhole shows. No jerks. Last November, I participated in a 48 hour band competition and created the band Comfort Zone in one weekend with three amazing people I had just met. You can read more about my experience in 48 hours at Como Collective. We stayed a band after that weekend and recorded our 11 songs for the album at the Hairhole back in March. You can see a bunch of photos from our 8 hour recording session here. Task Force is an awesome band that has been a Columbia staple for several years and they also practice at the Hairhole. We released the album at their last show for a while due to traveling band members. Here is a little teaser from the record – both of our bands have theme songs!!! Listen to them!!! You can order a copy on our etsy page or just find one of us on the street in Columbia. Last month, Columbia MO and many other parts of the country were infested with the sounds and the swarms of the 13 year cicadas. I was on tour with Dubb Nubb in Murfreesboro, TN when I first experienced their deafening sounds. Our couchsurfing hosts at House Pride told us their recipe for sauteed cicadas and Delia wrote a cicada song. The next day Lizzie sent me a song she wrote for cicadas and we decided that we had to do a compilation album! When we got back to Missouri things got a little nutty at Sparky’s and it seemed that everyone had something to say or sing about cicadas. I even met up with Josh from Butterflies in Chapel Hill, NC during the J-Tran tour and he wrote a song about the cicada ice cream fiasco. We ended up getting 17 songs (and a bonus track you get when you download the album!) 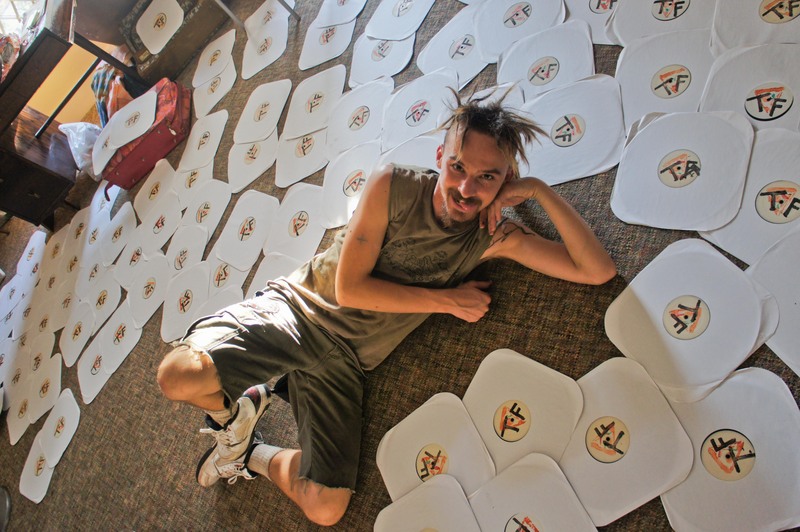 including some of our favorite bands and several bands that were formed just for the project. I’m really excited about the variety of the songs – there is acoustic, country, techno, ambient, rap, acapella, metal, electronic and rock n roll. On the last day to turn in songs, my new friend Nelda and I did a songwriting workshop with a music class at Missouri Scholar’s Academy. The group put together this song in about 30 minutes and we recorded it and surprised them at the end when we told them it would be on the album! It looked like this: On our walk home from doing the workshop, we ran into Robby Jones on his bike and he told us that he had also written a cicada song! He biked home and got his guitar and we recorded his song in 20 minutes as the last last minute addition to the album. 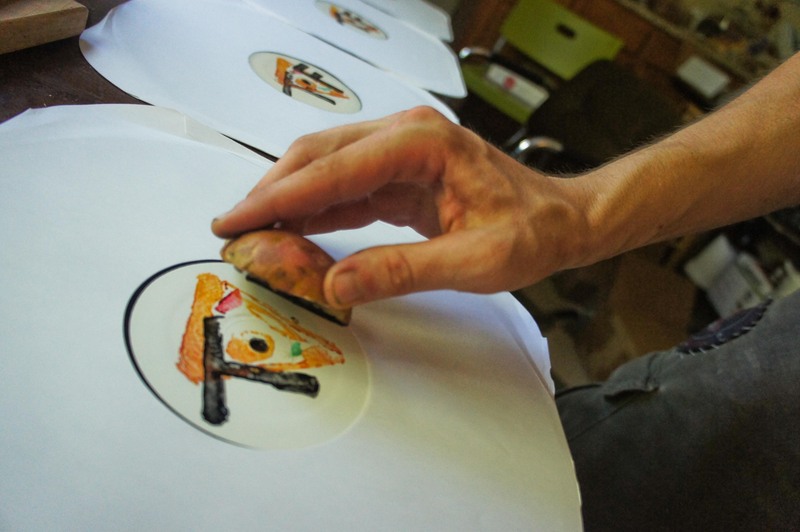 Nelda drew the CD label art which is a beautiful addition to the cover art by Justin Schultz. Thanks to Nelda and Kim for helping make all the CDs. Thanks to all thebands for participating and taking time to write and record such awesome songs. I hope you like the project – please download it for free on bandcamp, or any money you would like to donate will go to help us put out the next project. Apparently the annual cicadas are coming out soon – so watch out and enjoy your summer!